Born from clouds of gas and dust, stars like our Sun spend most of their lifetime slowly burning their primary nuclear fuel, hydrogen, into the heavier element helium. After several billion years, their fuel is almost exhausted and they start swelling, becoming cool and red -- red giants. These stars do not end in dramatic explosions, but die peacefully as planetary nebulae, blowing out everything but a tiny remnant, known as a white dwarf. Unusual fluctuations in the brightness of older sun-likestars have long mystified astronomers, and new, detailed observations of thephenomenon have only deepened the mystery. The new data, taken with the European Southern Observatory'sVeryLarge Telescope, contradict all of the explanations that astronomers havepreviously put forward to account for years-long variations seen in thebrightness of one-third of sun-likestars that are in the later stages of their lives. 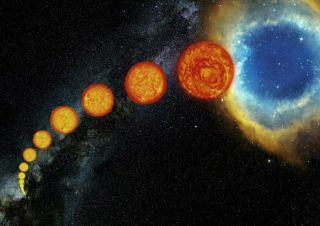 "We have obtained the most comprehensive set ofobservations to date for this class of sun-like stars, and they clearly showthat all the possible explanations for their unusual behavior just fail,"said study team member Christine Nicholls of Mount Stromlo Observatory, Australia. The mystery investigated by Nicholls and her team dates backto the 1930s and affects about a third of sun-like stars in our Milky Way and othergalaxies. All stars with masses similar to our sun become, towards the endof their lives, red, cool and extremely large, just before retiring aswhite dwarfs. Also known as redgiants, these elderly stars exhibit very strong periodic variations intheir luminosity over timescales up to a couple of years. "Such variations are thought to be caused by what wecall 'stellar pulsations,'" Nicholls explained. "Roughly speaking,the giant star swells and shrinks, becoming brighter and dimmer in a regularpattern. However, one third of these stars show an unexplained additional periodicvariation, on even longer timescales ? up to five years." In order to find out the origin of this secondary feature,the astronomers monitored 58 stars in our galactic neighbor, the LargeMagellanic Cloud, over two and a half years. But instead of backing up any of the existing ideas for whythese stars see additional fluctuations, the observations contradicted all ofthem. "The newly gathered data show that pulsations are anextremely unlikely explanation for the additional variation," said teamleader Peter Wood of Australia National University. "Another possiblemechanism for producing luminosity variations in a star is to have the staritself move in a binary system. However, our observations are stronglyincompatible with this hypothesis too." The team found from further analysis that whatever the causeof these unexplained variations is, it also causes the giant stars to ejectmass either in clumps or as an expanding disc. So with this new data, astronomers will have to go back tothe drawing board to come up with an explanation. "A Sherlock Holmes is needed to solve this veryfrustrating mystery," Nicholls said. The new findings are detailed in two papers appearing in theNovember issue of the journal Monthly Notices of the Royal Astronomical Societyand the Astrophysical Journal.